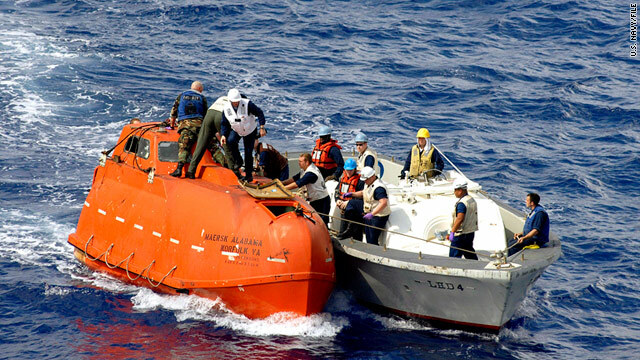 Captain Richard Phillips was held hostage on this lifeboat after pirates hijacked the Maersk Alabama in April 2009. (CNN) -- Pirates targeted the Maersk Alabama, the ship seized in a dramatic operation in the Indian Ocean waters two years ago. Four suspected pirates approached the ship in a skiff and a hook ladder, the Maersk said in a statement Tuesday. "The captain followed the appropriate protocol and authorized an embarked security team to fire warning shots in order for the pirates to turn away," the statement said. Shortly after, the boat took off and the ship was headed to the Kenyan coastal town of Mombasa. The Maersk's hijacking in April 2009 led to a hostage standoff involving Capt. Richard Phillips. Pirates captured the captain and held him for days in one of the ship's lifeboats. Navy snipers killed the captors and arrested one of the pirates, who was sentenced last month to more than 30 years in prison.